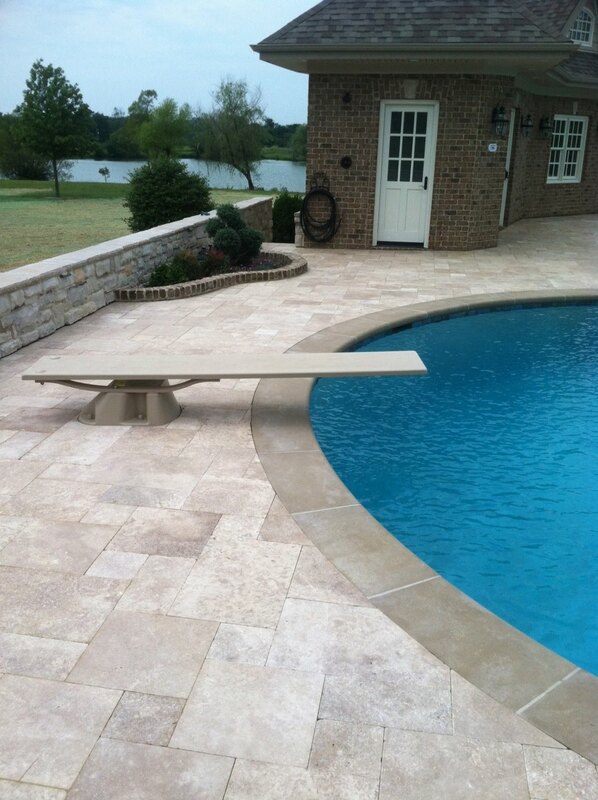 We specialize in installing pool decks in the Centerville, Liberty Twp and Dayton, Ohio area. 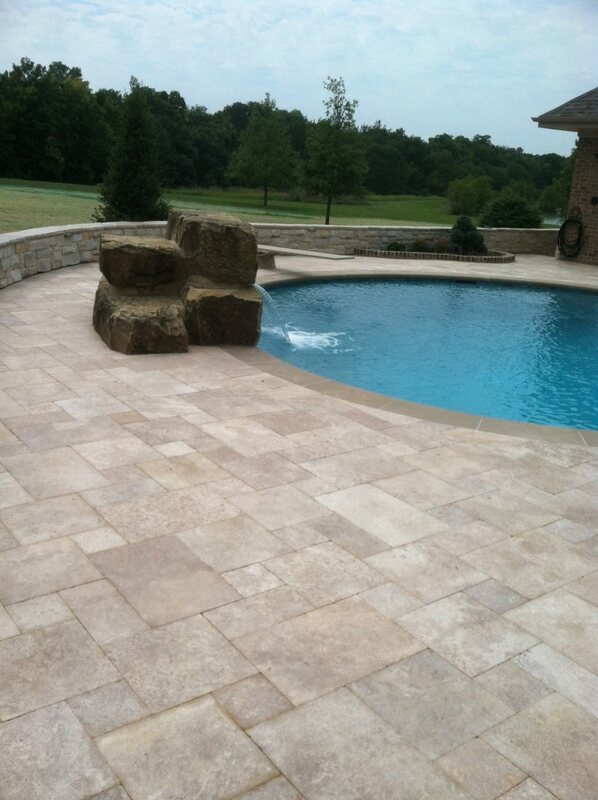 If you’re in the market for a swimming pool in the Dayton, Ohio area and area considering a pool deck made from concrete pavers, natural stone (bluestone or travertine) you will probably find that your pool contractor is really only concerned about the pool. Often times, the pool deck is just one more thing in the way of them completing the project and getting paid; and usually, pool contractors aren’t that knowledgable about pool decks and design. That’s ok though, let them stick to what they do best, building swimming pools. We believe the design of not only the swimming pool but also the pool deck is extremely important. We work with almost all pool builders in Dayton and can coordinate the design and installation of your pool deck with them. 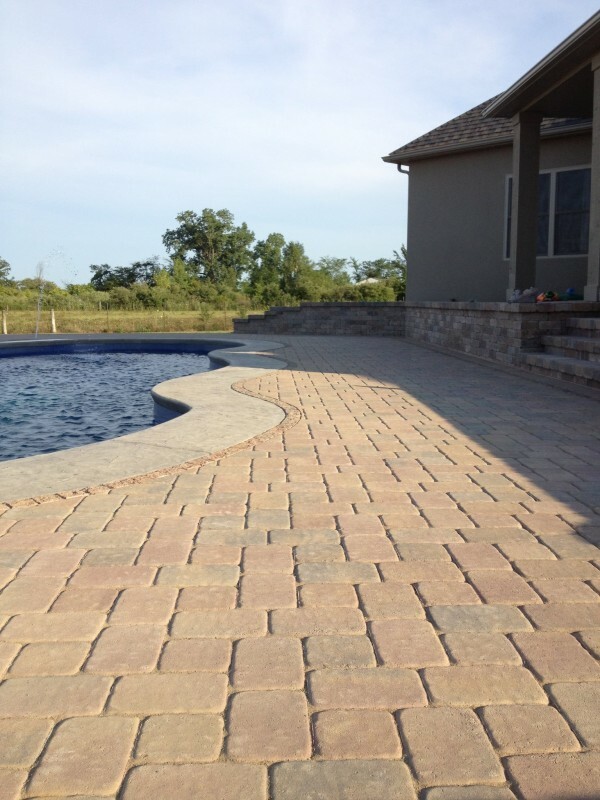 Paver Pool Deck in Dayton, OH. In most cases, your pool contractor will be happy to pass off this portion of the project. 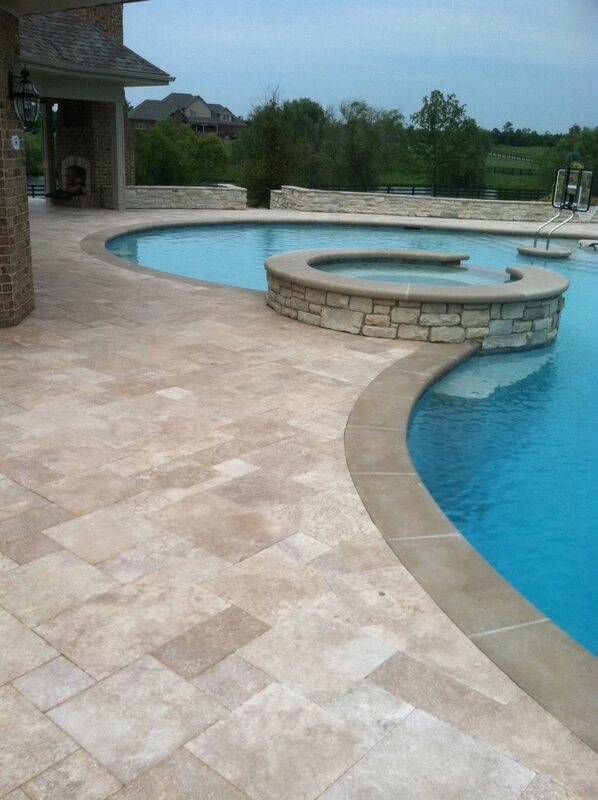 In some cases, pool builders/contractors will have their own paver installer or pool deck contractor. You will want to do your research on their subcontractor and even visit some of the pool decks they’ve installed in the past (preferably some that’s been down for a couple of years). When it comes to pool decks, especially paver pool decks, its important to understand how pools are constructed to properly design and install a successful pool deck. For example, with a fiberglass pool the pool contractor will over excavate around the perimeter of the pool to give himself plenty of room to work. Once they’ve installed the pool, some pool contractors will simply push loose soil around the pool that will continue to settle and cause issues with your pool deck like in the picture below. Since we’ve installed so many paver and stone pool decks, we know what needs to be done to ensure a successful long term installation; and we can instruct your pool contractor on what they should do as it pertains to the pool deck. 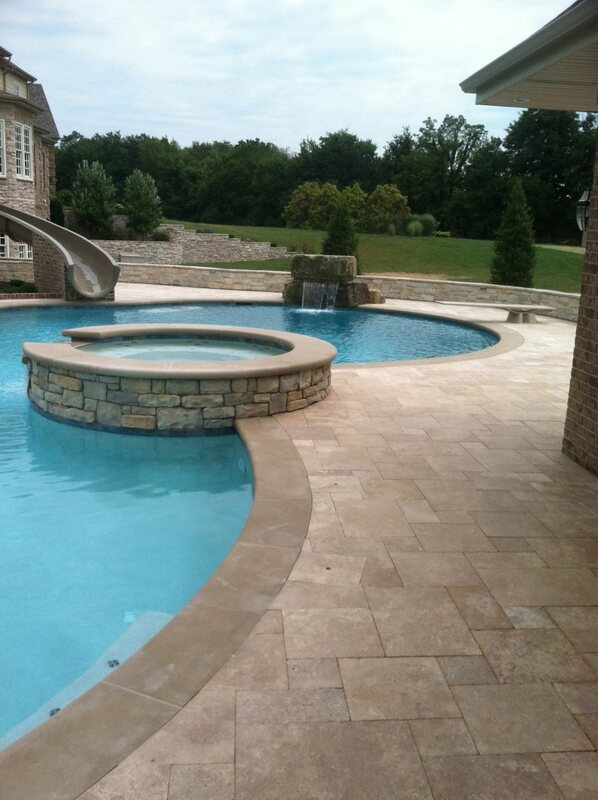 We install paver and natural stone pool decks around gunite pools (concrete pools), liner pools and fiberglass pools. 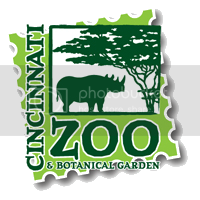 We install concrete pavers, brick pavers, travertine, bluestone, limestone and many other stone options. We install pool decks in Dayton, Mason, West Chester, Springboro, Centerville, Oakwood, Troy, Maineville, Lebanon, South Lebanon, Englewood, Yellow Springs, Beavercreek, Miamisburg, Waynesville, and Springfield, Ohio. 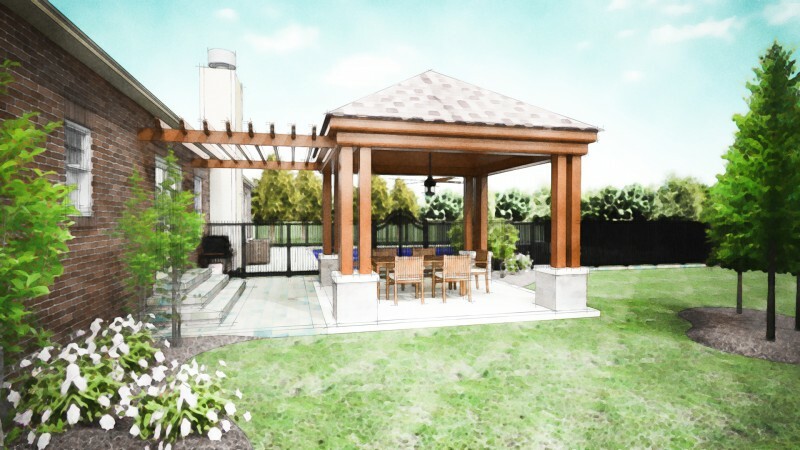 We also offer complete outdoor living space design that can incorporate the swimming pool, pool deck and landscaping all together. 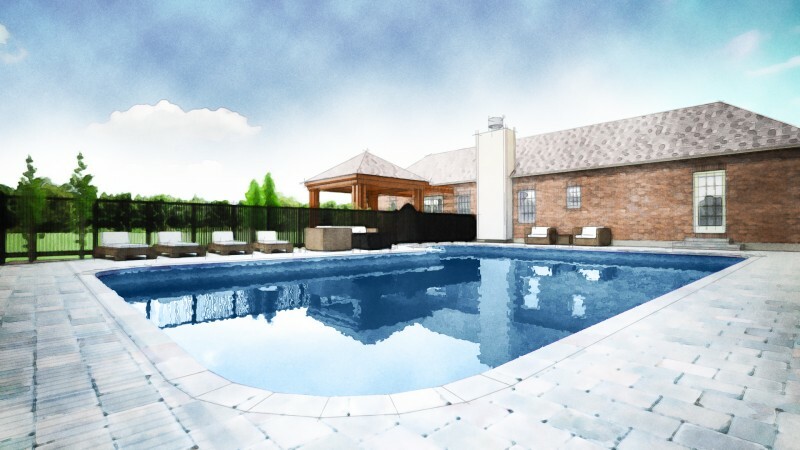 We work with our landscape architect and partner pool contractor to put together the total design. We can then manage the entire project including the installation of the swimming pool, landscaping, pool deck, and pool house. If you think that we would be a great fit for your project, please contact us.